RDoC’s provincial partners are collectively known as the Provincial Housestaff Organizations (PHOs). The seven PHOs represent the personal and practice interests of resident doctors within their respective regions. The relationship between RDoC and the PHOs is a fundamental one, even as RDoC has evolved into a blended model of membership. This relationship is multi-layered: RDoC has a relationship with the PHOs as a group as well as bilateral relationships with each PHO. These collaborations are essential to RDoC’s work on behalf of residents across Canada. Maritime Resident Doctors (formerly PARI-MP) represents over 550 residents training at Dalhousie University, practicing in hospitals and health care centres throughout the provinces of Nova Scotia, New Brunswick and PEI. We feature a staff of five who constantly work to improve the well-being of our members. In addition to negotiating the Collective Agreement and improving working conditions, we administer the residents benefits plan, conduct numerous wellness events throughout the year, and communicate regularly with our membership through email blasts and a quarterly newsletter. We also operate our Healthy Resident Fund, which offers funding to individual Programs to set up mental health or wellness initiatives for residents. The Professional Association of Residents of Newfoundland & Labrador (PARNL) is the official voice for approximately 260 postgraduate medical trainees registered in medical residency programs at Memorial University and completing training in hospitals and health care centres throughout the province.PARNL is the smallest provincial housestaff association member of Resident Doctors of Canada (RDoC). 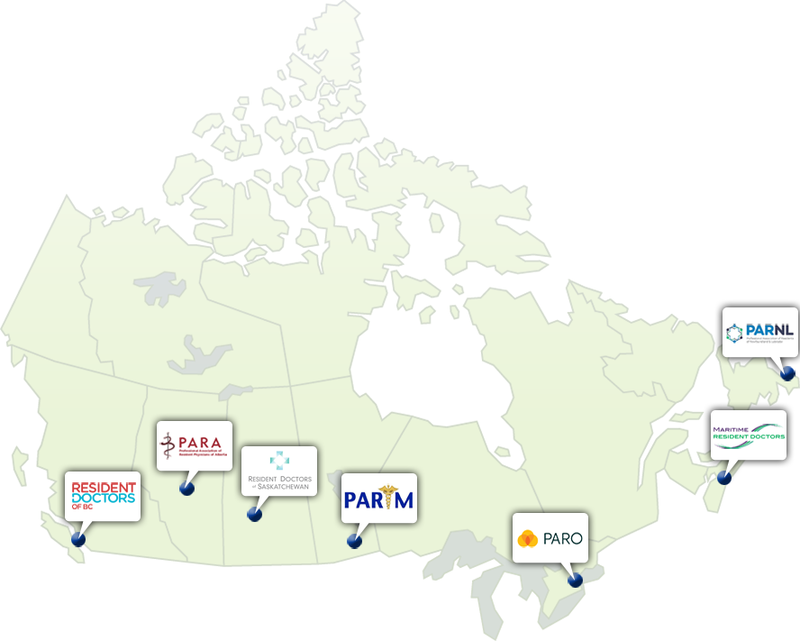 PARNL has representation on a number of national organizations (e.g., College of Family Physicians of Canada). Postgraduate medical trainees have a unique role as students, employees, teachers, and providers in the health care system. PARNL’s primary role is to advocate for improved salaries and benefits as well as ensuring the rights, interests, and well-being of our members. This is accomplished through the negotiation and enforcement of the collective agreement. A new agreement was recently negotiated with the various regional health authorities on behalf of Eastern Health and the provincial government and remains in effective until June 30, 2017. Resident Doctors of Saskatchewan (formerly PAIRS) was formed February 3, 1976 and officially became a trade union on April 19, 1996. We currently have 447 resident members training through the University of Saskatchewan located in Saskatoon. We have six official distributed education sites: Regina, Prince Albert, North Battleford, Swift Current, Moose Jaw and La Ronge.The RDoS Board of Directors consists of 21 voting members. We have a liaison council consisting of a non-voting program representative for each of the 22 training programs. Our RDoC Board Member for Saskatchewan and a representative of the Saskatchewan Medical Students Society are invited to each of our monthly board meetings. We have voting members on the University of Saskatchewan Faculty Council, Post Graduate Medical Education Committee, saskdocs provincial government physician recruitment agency, the Saskatoon Health Region Practitioner Advisory Committee, and the Saskatchewan Medical Association. Our office staff consists of our CEO, Kristin Johnson, and a part-time Executive Assistant Tara Carmichael. Our office is located in the Royal University Hospital on the University of Saskatchewan campus. The Professional Association of Residents and Interns of Manitoba is a non-profit organization representing over 600 resident physicians training in Manitoba. Founded in 1975, PARIM serves its members by advocating for resident well-being, professional issues, encouraging the highest quality of medical education, and ensuring excellence in patient care. Currently, the staff consists of the Executive Director (full-time) and an Administrative Assistant (part-time).Specific ongoing issues include Governance Reform, Communications Review, and the implementation of CBME. Our organization has not been updated since its inception; this year, we will be conducting a full review. In addition, we are upgrading our forms of communication. PARIM is also awaiting the change to CBME in Manitoba. PARIM members are looking forward to a number of Wellness and Social events again this year, beginning with our Welcome Party in August. We will also start planning for Resident Awareness Week shortly. PARIM is very fortunate to work closely with Doctors Manitoba to ensure that Residents are compensated fairly for the invaluable medical services they provide to Manitobans. To that end, Doctors Manitoba negotiates on PARIM’s behalf its Collective Agreement with the Winnipeg Regional Health Authority. It also provides advice and representation regarding the proper interpretation, application, and enforcement of the Collective Agreement. The Professional Association of Residents of Ontario (PARO) is the official representative voice for the 5000 doctors training to be specialists in Ontario.PARO champions the issues that create the conditions for residents to be their best and ensure optimal patient care. Optimal training, so that residents feel confident to succeed and competent to achieve excellence in patient care. Optimal working conditions, so that residents enjoy working and learning in a safe, respectful and healthy environment. Optimal transitions – into residency, through residency and into practice – so that residents are able to make informed career choices, have equitable access to practice opportunities, and acquire practice management skills for residency and beyond. PARO members elect a 100 member General Council which elects a 12 member Board of Directors. Resident Doctors of BC is a certified trade union with over 1300 members. In addition to bargaining the Collective Agreement, Resident Doctors of BC supports residents’ education and training to help them become well-informed, prepared and professional physicians. We accomplish this by encouraging excellence in teaching, promoting members’ professional, personal and financial well-being through educational workshops and social events, and working closely with stakeholders and the community to improve the training and working environment for residents in BC. We take care of resident doctors, so they can take care of patients and themselves.